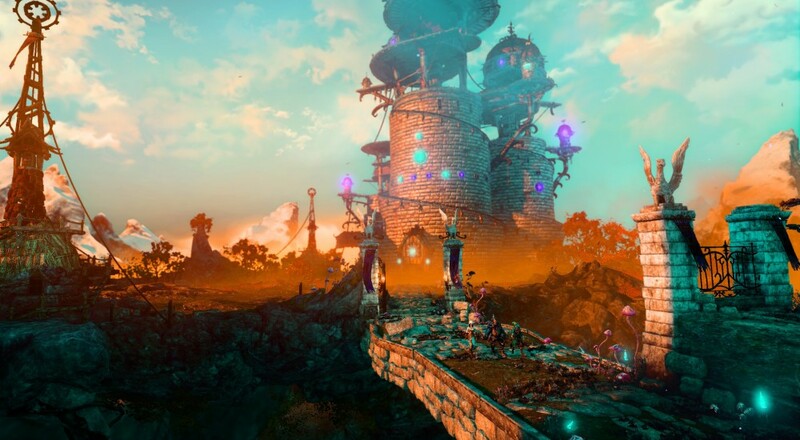 There's something to be said about the physics based puzzles in Trine. When they work, and the solution is somewhat obvious, it can be satisfying. But sometimes the game's physics simply don't cooperate, or the solution to a puzzle may not be easily seen. Soon you find yourself over-thinking Newtonian equations when really all the game wants is to have you jump on a box. Sometimes your co-op partner simply wants to troll you by dropping boxes on the wrong side of a see-saw. Whatever the game tends to throw at you it's as equally entertaining as it is frustrating. Last night's co-op stream had us continue our play through of Trine 3. We attempted to jump to Chapter 6, the next in the sequence, but quickly found ourselves blocked. We realized we needed to do some side missions to gather up the glorious golden triangles that let us progress. After knocking out three of them in 10 minutes we proceeded through Chapter 6 for the next HOUR. Newtonian physics be damned. If you watch any piece of this week's stream tune into the 14 minute mark. You can view Part 1 of our playthrough stream right here, which takes place during levels 4 and 5.